Takeaway: These 5 asanas are great for expelling negative energy, stress and anxiety. Try them for yourself and see if they bring more light into your life. The Anxiety and Depression Association of America (ADAA) reports that about 40 million people affected with anxiety disorders in the USA are adults. Clinical anxiety disorder can develop from a complex set of risk factors, including genetics, brain chemistry, personality traits, and life events. Even though it is considered highly treatable, only 36.9% of those suffering receive treatment. Besides negligence and taboo surrounding anxiety and depression treatment, there is also ignorance regarding the kind of help available for treating depression. Not many treatment-seeking depressed individuals know the worth of yoga intervention in treating anxiety disorders and depression. Yoga and coherent breathing intervention are supported in mainstream psychological care to help balance out the side effects of antidepressants. Yoga is also considered self-healing; an appealing alternative to help avoid developing a tedious dependency on depression medications. This sequences of five yoga asanas can help mitigate negative thoughts, and help you welcome all the light life sends our way. Anxiety and residuals from physical and psychological trauma gather at different zones of our body, one of them being the hips, where most emotional energy concentrates. 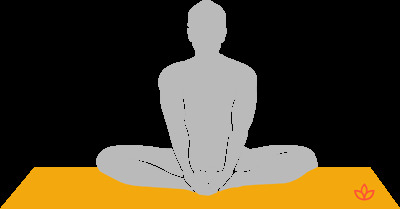 The butterfly pose or baddha konasana should be practiced in order to release the hips and facilitate the unblockage of pent-up energy through and out of the body. Keep on performing the baddha konsana for a few breaths and feel your heart fill with each breath. Chakra energy dynamics are extremely relevant when you are practicing yoga in order to up your spirits. Quick quiz: with which chakra lies the ability to express, communicate, be creative, and have good sense? It’s the fifth, the throat chakra, addressable by poses such as the Urdhva Mukha Svanasana. When you learn how to express your mind, the acute repressions, violations, and negativity shall be released and transformed into something creative. Breathe into the expansion of your chest and the activation of your throat chakra. May your expressive spirits explode out of this pose. Core strengtheners like the Plank Pose must also be featured on this list. You can only feel good when you are feeling strong. Core strength is the back bone of confidence and courage; the kind needed to clinch difficult jobs and take risks. Hold the pose for a few breaths and then lower. Utilize this pose to help conquer negative forces. Spare a thought for your jaw line. Stress and negative anticipation can stiffen up your facial expressions causing obstacles in being friendly and presentable. The reflexive action of gritting one’s teeth during periods of stress further intensifies the negative disposition. While the chain of reaction can occur from mental state to physical manifestation, the reverse can also occur: physical relaxation to mental relaxation. The last resting pose of this anxiety ridding sequence is savasana or corpse pose. In the stillness and repose of savasana, you can do some positive introspection and potentially route out the cause of depression. Ecstasy and gloom come in peaks and valleys. Work to achieving equilibrium to help find contentment.